The Galapagos Islands form an archipelago consisting of some sixteen islands and numerous islets scattered over an area of nearly 36,000 square miles around the Equator. Situated in the Pacific Ocean, 600 miles west of Ecuador, on the western coast of South America, they were undisturbed by humans until the sixteenth century. 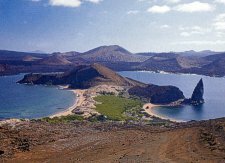 Since then, interest in the Galapagos Islands has steadily grown, first regarded as some by entirely mythical, then used as a hideout by pirates, later exploited for its animals and natural resources by whalers and sealers, and finally permanently inhabited by man and incorporated into Ecuador. 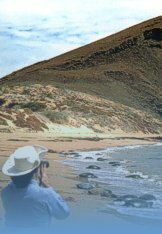 The real fascination with the Galapagos, however, began with Darwin’s journey, research, and extraordinary inferences about the flora and fauna that had developed uninterrupted for millions of years, creating a living laboratory that firmly established his theory of natural selection. Since Darwin’s time, visitors have flocked to the islands to view the captivating, one-of-a-kind ecosystems first-hand, and scientific research has continued to help answer crucial questions about the fundamental nature of our world and its history. The Galapagos Islands are about 4 million years old, though the youngest are still being formed today by active volcanoes. As far as historians can determine, the islands remained untouched by humans until the sixteenth century, when, in 1535, the bishop of Panama, father Tomas Berlanga, landed there accidentally due to strong currents and no wind. He wrote about his adventure, describing the desert-like environment and the gigantic tortoises. In 1978 the Galapagos were designated as the first World Heritage site, and when the Galapagos Marine Reserve was established in 1998, that too was designated a World Heritage Site. They are a Biosphere Reserve, a Whale Sanctuary, a RAMSAR site and they have recently been designated as one of only two Particularly Sensitive Sea Areas (PSSA) by the International Maritime Authority. In Fernandina they possess the largest 'near pristine' island in the world. The prehistoric feel of the Galapagos Islands is due in large part to its unique reptile population, the most famous, of course, being the varieties of native turtle. Like the birds and mammals of the islands, the indigenous reptiles are found both scurrying on land and gliding through the water. The land iguana, huge and exotic, may be startling to come across on a sun-baked rocky coast, but perhaps not nearly as shocking as watching a 3-foot long marine iguana jerk back and forth rhythmically as it rockets quickly by under the water to reach the algae upon which it feeds. Because the long journey to the islands was not well suited to mammals, there are very few indigenous to the Galapagos. Of those, only two are land mammals, both of which are rice rats. The marine mammals are a true joy for tourists and locals, however. The rare sight of a sperm whale rising out of the ocean is breath-taking, as is the spectacle of a bottlenose dolphin leaping out of the water beside a boat, even doing flips in the air for the entertainment of the sailors. 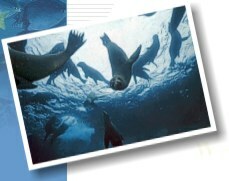 And of course, sea lions, famously comical and playful creatures, never tire of amusing snorkeling and scuba diving visitors. The sperm whale, the largest toothed whale, grows to be between 33 and 60 feet long. Its most distinctive feature is its box-like head, which makes up about one-third of the whale’s length. 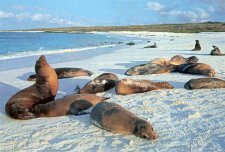 The most common native mammal that travelers see during their visit to the Galapagos is the Galapagos Sea Lion, a subspecies of the Californian Sea Lion. An estimated 50,000 live in the Galapagos. The territorial bulls, which can reach up to 7 feet in length and 800 pounds, are quite aggressive and have been known to chase swimmers out of the water. They have also been known to bite if harassed, so visitors are advised to give them there space. The females and the young, on the other hand, are social, curious, and often swim playfully around snorklers and scuba divers. The giant tortoise is the symbol and namesake of the Galapagos Islands (“galapago” is the Spanish word for tortoise, derived from the word for “saddle”). They truly are giants, weighing up to 550 pounds and able to walk carrying several hundred pounds of additional weight on their backs. The tortoise’s life span is somewhere around 150 years; thus, tourists visiting the islands today might see some of the same tortoises lumbering through the mist that Charles Darwin saw in 1835. There is only one species of giant tortoise, which has been divided into fourteen subspecies, each in some way distinctive to the island on which it resides. Galapagos Islands plants are as spectacular as the wildlife. No where else on earth will you find cactus intermingling with cotton against a backdrop of daisy trees. Rare, common, native or introduced, Galapagos Islands plants come in many varieties. In recent years, introduced Galapagos plants have taken center stage, threatening native species and upsetting the natural balance of life on the islands. Conservation programs supported by sustainable tourism are helping to reduce the impact of introduced Galapagos plants on the islands’ fragile ecosystems and protect native plants and wildlife.